Taste of the Wild dog and cat foods were created to give pets and discerning. their pet food must contain all the proper ingredients and nutrition they need to . Buffalo, Lamb Meal, Chicken Meal, Sweet Potatoes, Peas, Potatoes, Canola Oil, Egg Product, Roasted Bison, Roasted Venison, Beef, Natural Flavor, Tomato Pomace, Potato Protein, Pea Protein, Ocean Fish Meal, Salt, Choline Chloride, Dried Chicory Root, Tomatoes, Blueberries, Raspberries, Yucca Schidigera Extract, Dried. 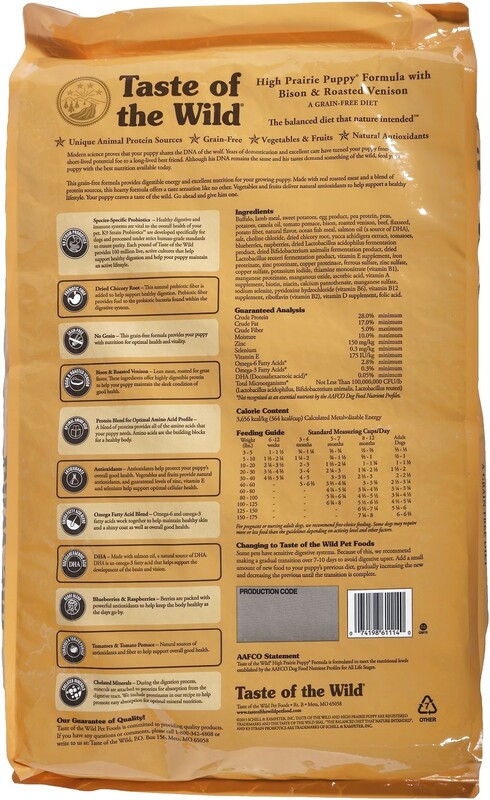 The Taste of the Wild product line includes 9 dry dog foods.. Ingredients: Beef, peas, garbanzo beans, lamb meal, canola oil, egg product, wild boar, ocean fish . A taste of the wild with SMOKED SALMON; REAL SALMON is the #1 ingredient; optimal amino acid profile, PROTEIN rich for LEAN, STRONG MUSCLES .